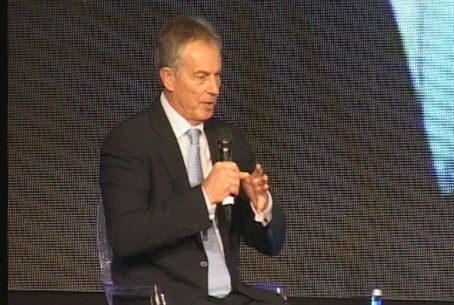 Quartet envoy Tony Blair told Presidential Conference participants Wednesday that facing the prospect of a military confrontation with Tehran is a better option than having to grapple with a nuclear Iran. The former British prime minister said in his address to the conference participants in the fifth annual gathering in Jerusalem, "We should be determined to overcome the threat from Iran. "Those who have power in Iran should feel our resolve, and understand that we will not back down," he added. "Of course, every military option is something we do not want – but a nuclear Iran is the worst thing." The Islamic Republic’s new president-elect spoke approvingly years ago about the need to hide Iran’s nuclear development activities. "As for building the atomic bomb, we never wanted to move in that direction and we have not yet completely developed our fuel cycle capability. This also happens to be our main problem... If one day we are able to complete the [nuclear] fuel cycle and the world sees that it has no choice, that we do possess the technology, then the situation will be different," he said. "The world did not want Pakistan to have an atomic bomb or Brazil to have the fuel cycle. But Pakistan built its bomb and Brazil has its fuel cycle, and the world started to work with them. Our problem is that we have not achieved either one, but we are standing at the threshold." He added that the program was never intended to be in the open, however. "This [concealment] was the intention.... But in any case, the spies exposed it. We did not want to declare all this."